Most of you know I NEVER blog in the morning - always in the wee hours of the night, but not today! I have a special offer for my Blog friends (this again is something I never do on my blog!). After a full weekend of teaching classes I have found that I have a few extra kits left and wanted to offer them up to all of you that are not able to take my classes in person. Each kits will have all of the supplies (minus, inks, tools, adhesives & stamps) needed to make the project, a CD with full sized color & detailed images of the project and all of the step by step instructions needed to complete the project. It will also include a list of all the supplies, cut sizes, tools and embellishments needed in case you would like to make more of the same project. So here is what I have available for you. . . 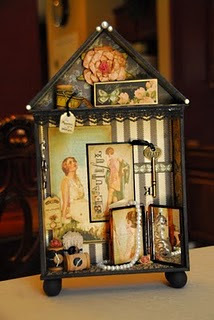 In this kit you will be building the shrine from scratch, then wall-papering it and embellishing it. It is super fun and I think you will love learning how to build the shrine for different occasions. You can click on the photo for more detailed images of the shrine. This was a VERY popular class - I had to teach it twice! You will be altering this book box and then making a mini for inside. It has a great wire and bead binding on it and lotts of interactive parts. 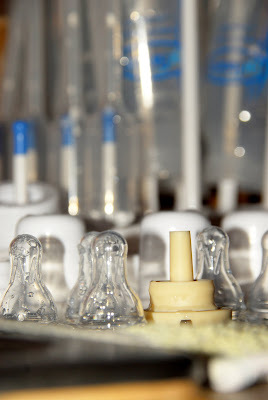 You can click on the photo for more detailed images of this Project. Garbonzobeenz1@aol.com and tell me which one(s) you are interested in. Please include your name, mailing address and email address. I will send you a paypal invoice once I receive your request. Your Kit will be mailed out on the first Friday after I receive your payment. Well, I gotta get back to Monkey and The Bug . . .
Just an Ordinary Day. But it was a day I never want to forget! Mom was gone all day and so it was just the girls and I all day today. I woke up to a very cool and wet morning - ahhh, so refreshing this time of year. The rain quickly gave way to sun, but the cool temps and the breezes continued throughout the day. We did all of he typical things, bottles, diapers, snacks, and the Disney channel. My Bug was a little fussy today so Monkey was left to entertain herself (with the Disney channel, toys and books) while I tended to her sister. Finally, my Bug drifted off to sleep and then Monkey asked to take her nap. As I tucked her into her big girl bed she gave me the regular daily assignments. . .turn off the light, shut the door all the way. After I turned off the lights and was turning to go out the door, she called me back to her. "I need to say my prayers Amma" she told me. My heart melted! 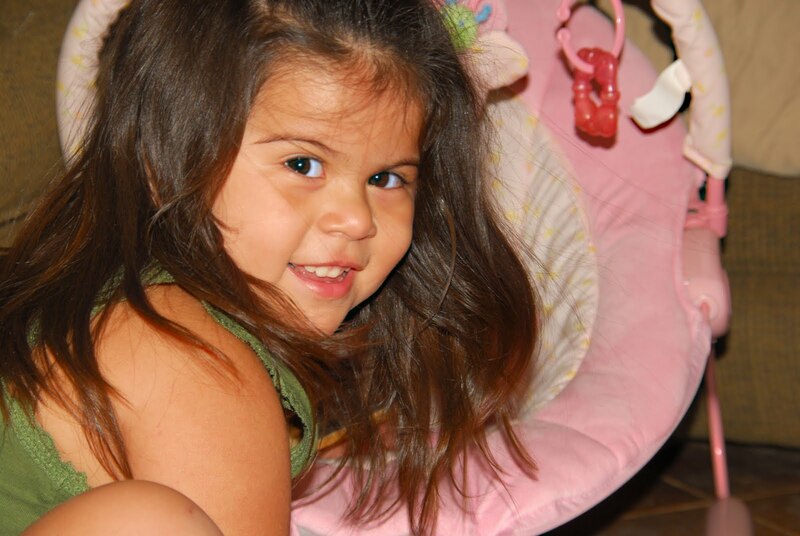 This is a new thing, she has just recently started to go to Sunday School and without prompting has been asking her Mom to pray with her at night before she goes to sleep. But this was the first time she has ever asked me to do it with her. I am ashamed to say that I never think of it when I put her down for a nap. My mind is usually fixed on the things I need to do while she sleeps. So, with my heart so full, I kneeled there next to my 3 year old granddaughter's bed while she folded her hands, closed her eyes and said the simplest prayer "my mommy, my daddy, amma, grandpa, nana, stud, rifle". She was asking God's blessing on us. Then she looked at me and said "you Amma", she wanted me to pray with her and so I did and she sweetly repeated every word I said. After saying Amen, we had to do the little poem with the hand gestures, here's the church, here's the steeple. . . .you know the one. I taught her that a long time ago and she loves to do it. Now it was time for one more kiss and once more to be reminded to shut the door all the way and off to sleep she went. I never want to forget that 3 minutes I spent kneeling on the floor. I have always believed in the power of prayer and have spent a lot of time in my life on my knees praying, but I don't think any of those times were as sweet, as innocent, as powerful as that 3 minutes were to me today! How I would love to have a photo of the two of us in there today. But here are a couple of sweet photos from the day. 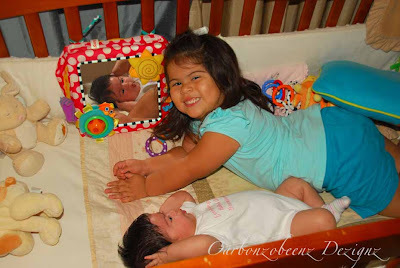 . .
After the girls woke up from their naps, Monkey wanted to see her sister and I thought it would be funny to lift her into the crib with my Bug. She looked up at me and said "we're cute Amma, take our picture" who could ignore such a request? Tuesday I wrote about how close Christmas was and how us crafters are needing to get busy with our homemade gifts. Last night I took my own advice and got busy on my stocking stuffers for Christmas Eve at Gary's Mom's house. There are 30+ of us when we are all together and although we draw names for gifts we do put something small in everyone's stockings. That's A LOT of little gifts to come up with. People put all kinds of things in there - nothing big. Someone usually puts a disposable razor in them, some lip balm, lotion, candy and so on. I usually try to make something (surprise, surprise). Something that can easily be duplicated several times (like I did snowman poop bags one year). This year I am taking care of the girls' stockings and making Gary take care of the boys. So here is what I made for this year. . . They are homemade facial puffs. I cut out and sewed 55 of these little cuties yesterday. Today I got them bagged up in pairs while the girls napped. I will make a little tag to attach with them soon on my computer (and maybe a little stamping). In case you were interested I took pictures along the way to show you how to make them if you want to give it a try. Lay the twill on top of the cotton fabric and sew a 1/2" seam all the way around your sandwhich twice. The twill be a nice handle to hold your facial puff. Once you have them all sewn up, you cut from the edge up to (but not through) the seam every 1/4 inch. It should look all fringey like the photo above. After their hair-cuts they will look like this and be ready to be used. They are really soft and cute and are great for eye make-up removal, face cleansers, applying bronzers to you skin, anything really. 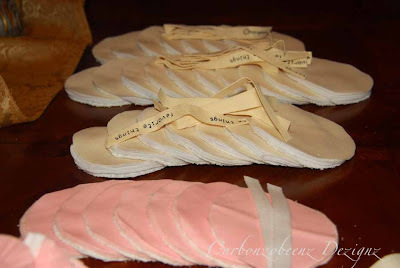 And they are reusable, just toss them in the wash like you would a wash cloth! Super cool, inexpensive, useful, eco-friendly gift! Give them a try - make them any size or shape you want. 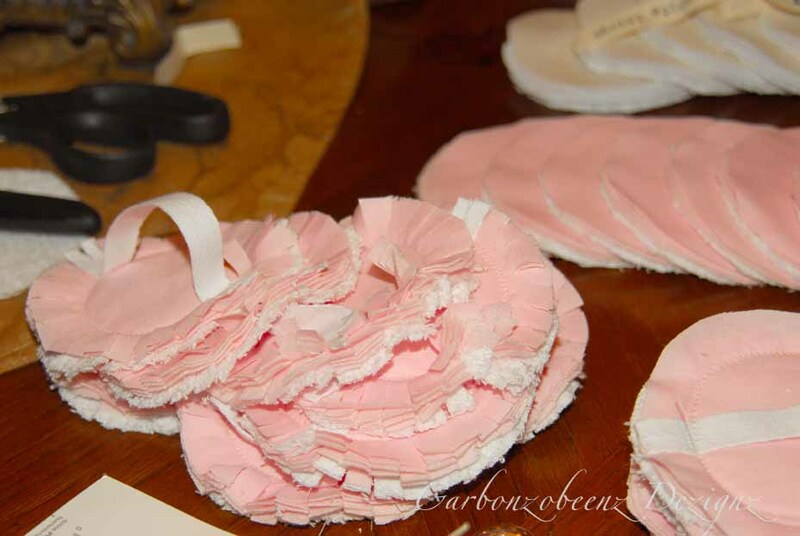 If you are a powder user, trade the cotton fabric for a satin, the terry layer for another flannel and the twill for satin ribbon and you will have a beautiful powder puff to put your face powder on with. 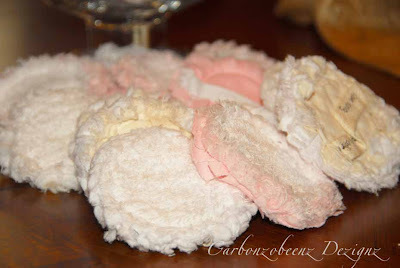 I always think of my Grandma Peterson when I think of a powder puff. I bought her body powder with a beautiful puff every year for Chistmas when I was a little girl. I wonder if anyone uses those big dishes of fragrant body powder anymore? Well, I better get ready for bed - teaching tomorrow. I am teaching my "Measure of a Woman" class tomorrow. I wish I had some satin fabric in the house. 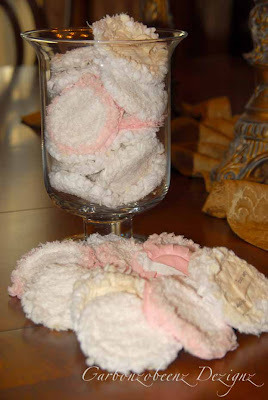 I would make some of those powder puffs as my door prize for class. It would have fit in perfectly! Oh well. Have a great weekend friends! That's right, that's how many days left till Christmas!!! If you are a crafter, it's crunch time! Have you made all of your plans? Have you gathered all of your supplies? These are the questions we are asking ourselves right now. I was running around today (Hobby Lobby, Joann's, Michael's) getting some last minute supplies for my class on Friday when my cell phone rang. It was my Sister-in-law, Char (the only other crafter in my family) wanting to know what I would be bringing to Thanksgiving dinner. As if she didn't know - I always bring pumpkin pies, have for 26 years now. But while we were on the phone the subject quickly changed to what we were each making as Christmas gifts. It's important that we don't make the same things. At this time of year I especially wish there were two of me, one to do all of the things that need to be done in my life and one that could be busy creating and enjoying the process of making the gifts. I have started a new habbit while I craft these days. 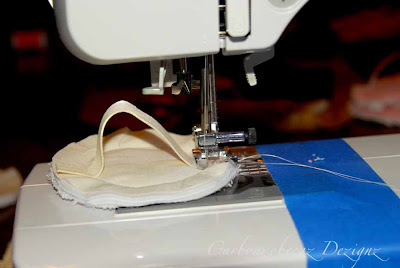 As I am working on something I pray for the person that I am making the item for. I pray for their health, saftey and happiness as well as for our relationship. I got this idea from a woman I have never met that emailed me from my blog one day. She told me how I had inspired her to start creating again and that she prayed for me while she worked on her latest project. I was so moved and I thought what a great yet simple idea. How much more meaningful the item had when it was finished, even though the receipiant would probably never know that I was praying for them. Typically I just allow my mind to wander (all over the place) while I work on things, and it still does at times, but I really try to stay focused on the person and my prayers these days. It has added a whole new level of joy to the things I create now. Well it is late and I have much to do before the munchkins come in the morning - one of the things I want to do is sleep! So I should run. Just wanted to check in with everyone and wish you a great week! That's what I have been these days and that's why I have been so absent from my blog and blog friends - Sorry. But tonight I am going to try to catch up on the past few weeks. Lots of pictures tonight. So, one of the things I have been busy with is creating and kitting class projects for The Quest. This Saturday is the 1st session on Hallowe'en in Wonderland. Next weekend is the the 2nd session (yes, I am teaching it again!) and the Measure of a Woman Shrine class. 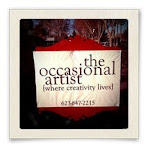 There are lots of jumbo ziplock bags ful of pretty papers and such in my studio right now. 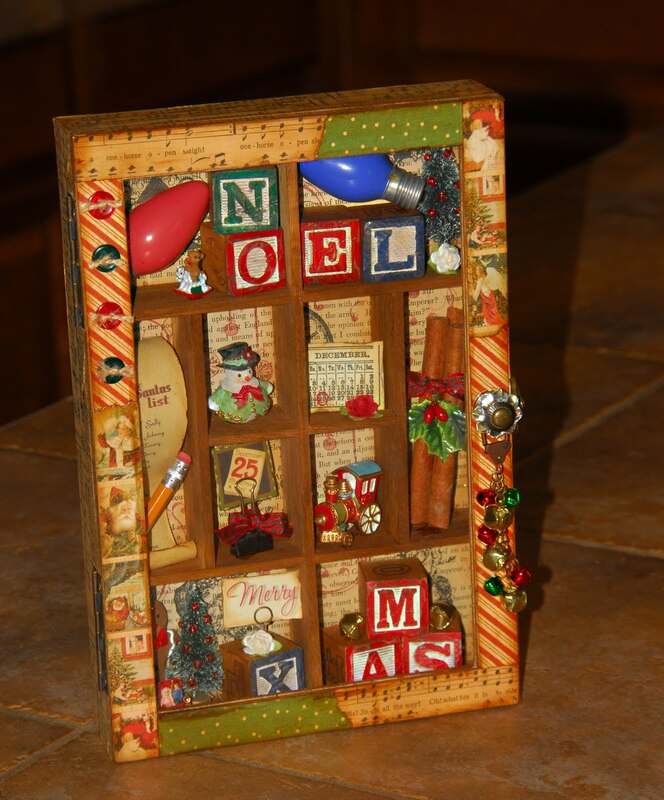 This is a new class sample called Santa's Workshop Curio - the photo here does not show the completed project - it is missing it's really cool Tim Holtz legs. But you can see the finished product at The Quest if you stop by. I will be teaching this class on Sat. Nov 13th. Another thing I have been busy with is playing with my Monkey! Oh My Goodness - she is just the funnest (is that really a word?) kid ever and I just LOVE playing with her. 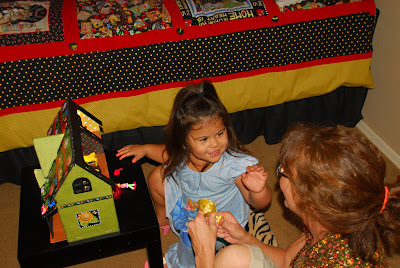 She adores her doll house and plays with it everytime she is here. This was a night that she asked me if she could just come to my house for dinner. Who could refuse this face? 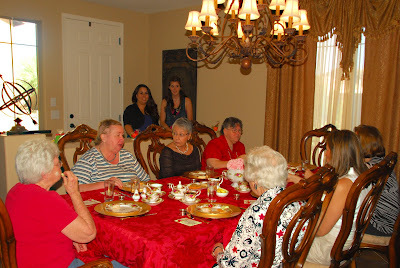 Another thing that took up ALOT of my time was the planning a surprise birthday tea party for my Mom's 75th birthday. This is no simple feat when your Mom lives with you!!! 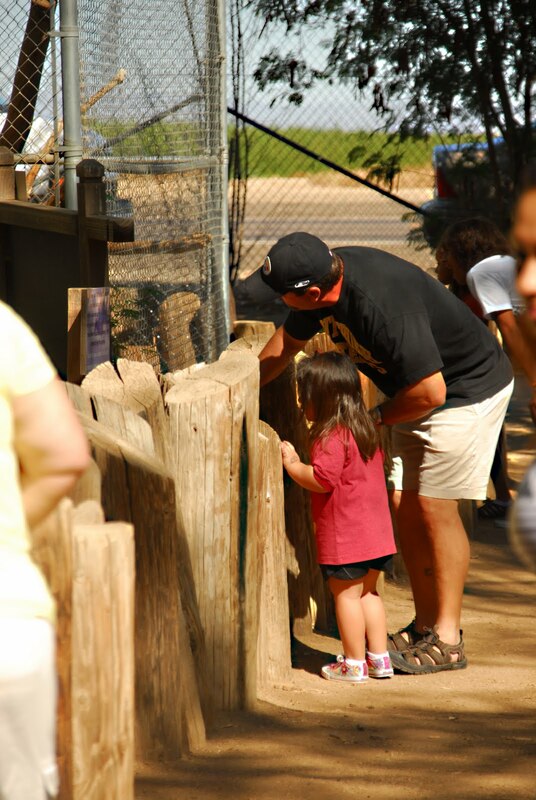 But it came off without a hitch, she was surprised and everyone seemed to have a great time. For about 2 weeks I lied almost daily to my Mom and she was banned from certain areas of the house and from the refrigerator in the garage - that one took a very creative lie to keep her out of there and not be suspicious! After sewing all of the bedding and curtains etc for both of my granddaughters, I have fallen in love with my sewing machine again. 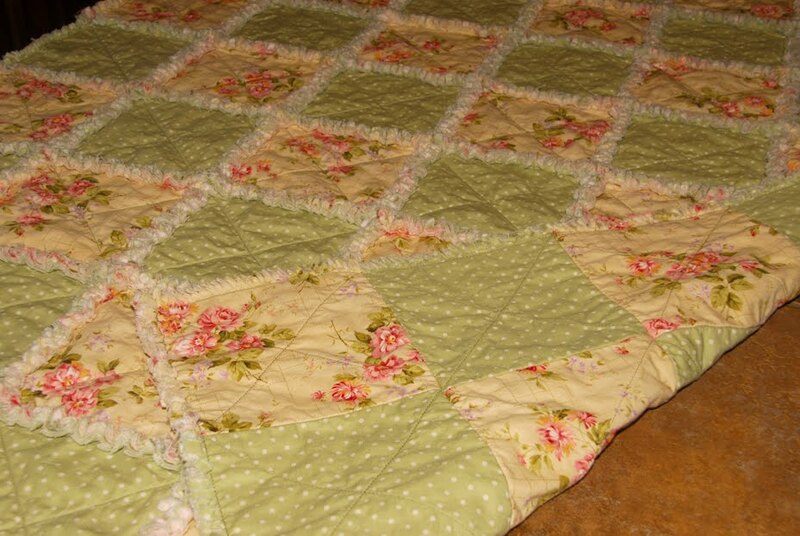 The week before the girls came back (Bryanna & my maternity leave ended on the 4th) I made 2 rag quilts. They are super fun to make! 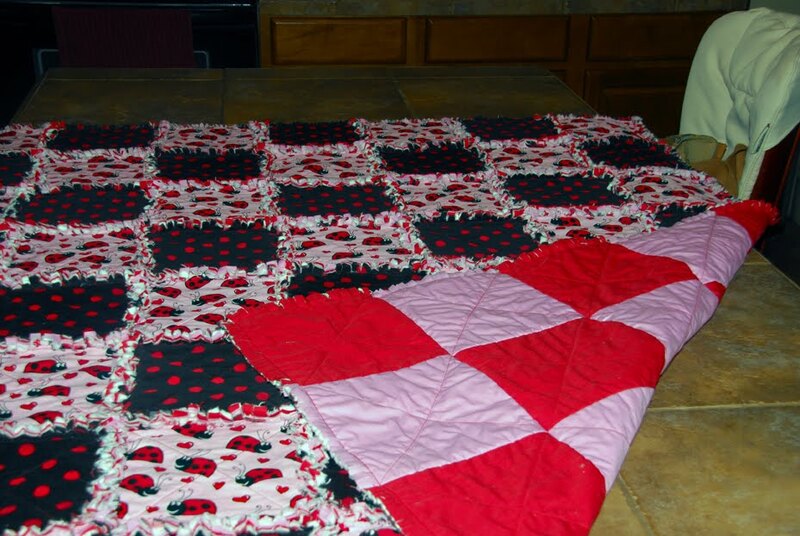 So this is the one I made for my Lady Bug (my newest granddaughter). I made a Monkey quilt for her big sister when she was a baby for her to use as a pallet at my house, so I figured I better get one made for my little Lady Bug! I just love all of the fabrics I used on this, cotton, corduroy, flannel and chinz all in pink, black and red - very fun! This one is a Christmas present - can't say for who just in case they are checking in here! But I really think it is pretty and feminine. Then of course there was one more trip to the pool before the season is over. 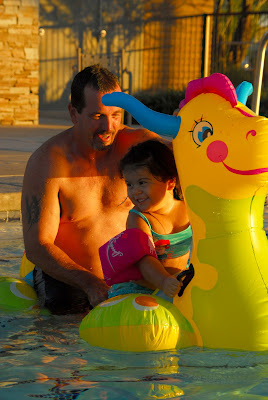 This summer I actually never made it to the pool all season so I couldn't pass this up - had to get some pix of my Monkey and her grandpa at the pool. They are pool buddies and this is their special time and place. And of course before the girls started coming here everyday I felt it was important to wash EVERY toy in the house!!! 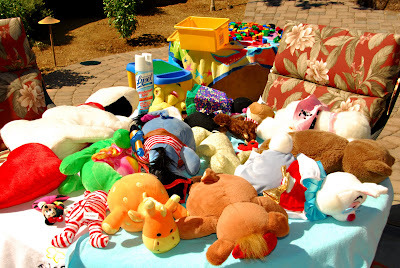 There wasn't a flat surface in my house or on my patio that wasn't covered with toys drying after being washed! 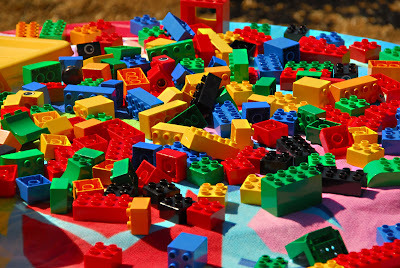 BTW - washing Leggos is NO FUN at all! This past weekend I took some pictures of my little Lady Bug - this is one of them. I ordered this Union Jack Flag just for this purpose when she was first born. I don't usually use my grandbabies names here but I will make an exception this once - her name is London, that is the reason for the flag. She is almost 3 months old now! 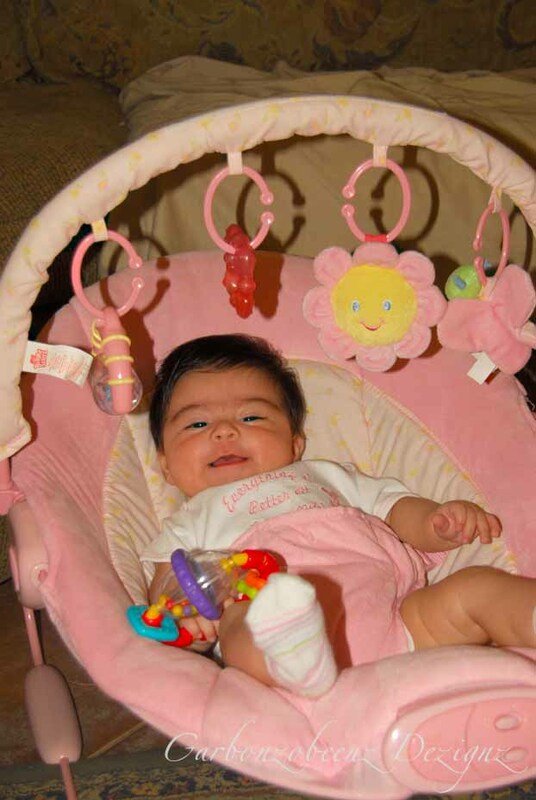 Here are some pictures of My Girls just hanging out at Amma's while Mom and Dad are at work. They are just the sweetest and happiest girls ever. 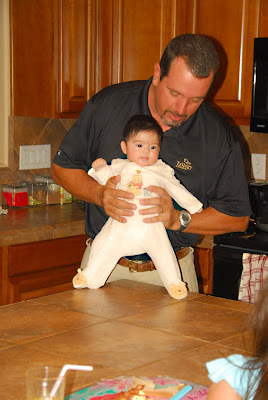 I was a little worried about how it would be with a baby in the house again. But that was just wasted time. 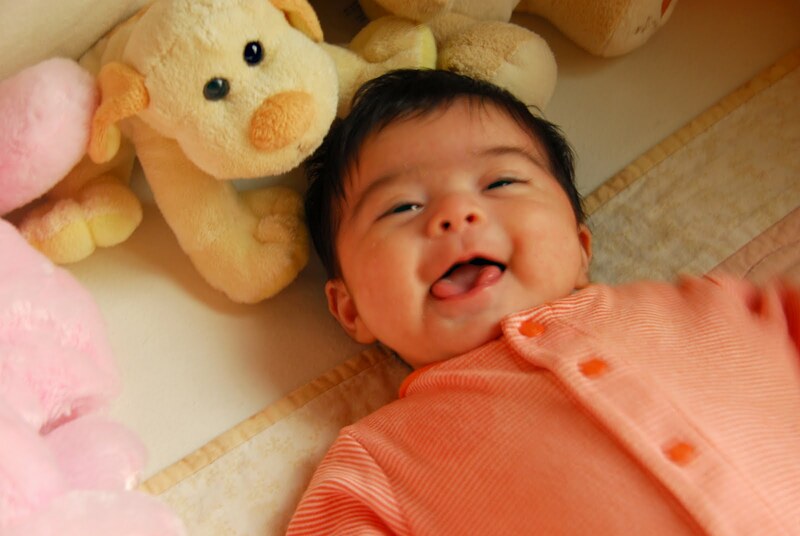 She is a great baby - so content and happy and no problem at all. Gary made breakfast Tuesday before work for Monkey. She loves for Grandpa to cook for her. 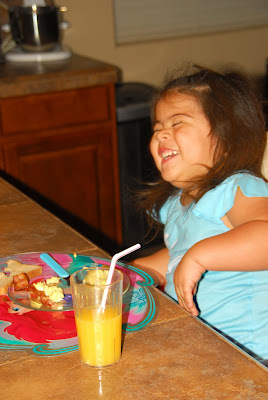 Since Lady Bug can't eat his cooking yet she was the entertainment! Gary had her dancing on the counter and trying to stomp on Monkey's plate. Everyone really enjoyed this. He has such a great way of playing with the girls and they just love it! Gary took the rest of this week off and yesterday we took both girls to the zoo. That was really fun but man was it HOT! Typically it is only in the high 80's this week each year - but noooooo - it was about 100 degrees out yesterday! After 4 hours in the sun we were all ready for the AC in the car and to get home. This was our first outting with both girls with out their parents - it takes some coordination to have a toodler and an infant out and about like this. Sadly I didn't get very many pictures and the ones I did get were just snap shots. Gary was in charge of Monkey and I was in charge of the Bug, the stroller, all of the bags, and the camera. I was a busy girl! So, that is pretty much what has been going on in my world lately. It has been a really busy time for me, but a really great time as well! I am truly blessed to have so much joy in my life!!! I will be back soon with more pictures and news about a new year-long project I will be hosting at The Quest, so come back and check it out - I think you're gonna like it! 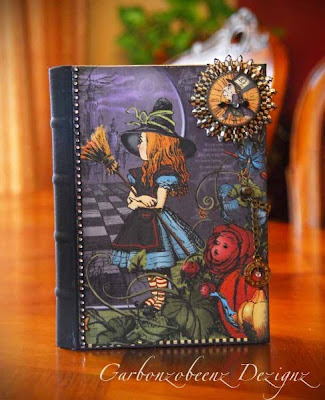 "Hallowe’en in Wonderland Book in a Box". . . I am so excited to tell you that a second class for this project has been added! So if you did not get signed up for the first sold out class, call the store right away to get signed up for this one. This class will be limited to only 8 students and no extra kits for purchase. Click the "Upcoming Classes" tab at the top for full class info. I hope to see you there! Click on the photo above to see all of the goodies inside!